On February 11th, 1970, Japan’s first satellite, OHSUMI, was put into orbit by the L-4S launch vehicle. The L-4S was succeeded by the Mu model series, which evolved from the first model, M-4S, to M-3C, M-3H, M-3S, M-3SII into the latest model, M-V, which enjoys a reputation as one of the major launch vehicles. The Mu model series are solid propellant rockets. This series has shaped the history of the launch vehicle for scientific satellites in Japan and has played an indispensable part in the space probe program through its observation of supernovae, aurora, and Haley´s Comet. 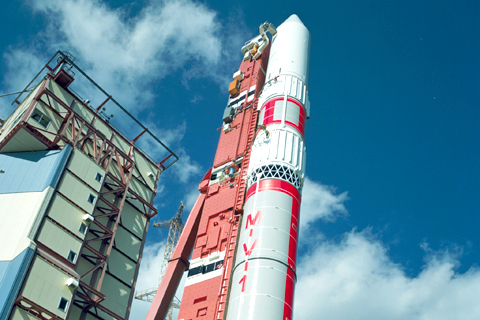 M-V has contributed to the development of X-ray astronomy and infrared astronomy, and has also been used for the exploration of the solar system, a project commonly known as planetary exploration or the moon probe. * The launcher could not put the satellite into orbit because of the lack of final velocity due to 1st stage combustion failure.